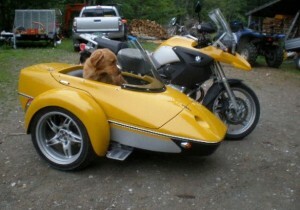 I first saw the sidecar that would be mine at the BMW Motorcycle Owners of America rally in Johnson City, Tennessee. It was attached to a 2007 BMW R1200GS, a virtual twin to the bike I already owned. This meant I already had the tools needed to wrench on it, already knew how to perform routine maintenance on the bike. The Hannigan sidecar was a sleek fiberglass affair painted a bright metallic yellow with the bike painted to match. The design included a clamshell lid with a high rim that, to my mind, was more dog safe than the traditional hacks with the step-through tub. 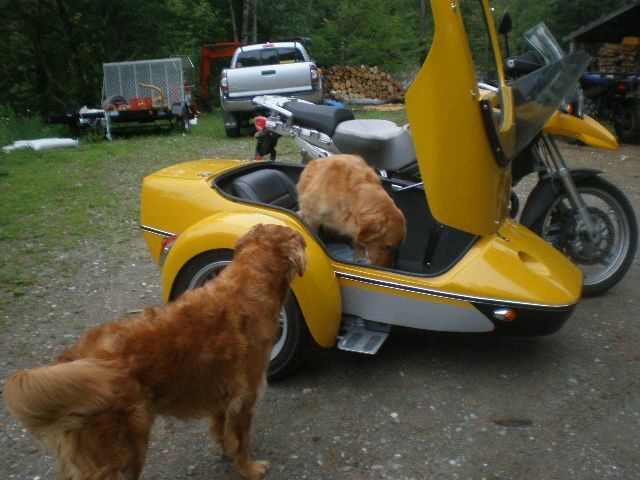 I returned to Vermont with sidecars on my mind. I investigated other brands, but while I found them attractive I always came back to the sleek lines of the Hannigan. A year later the gently used rig from Tennessee went up for sale. I put a deposit on it immediately. The dealer asked to use it one last time as a static display at the Americade Rally in Lake George, New York. Bonus for me! Americade was just a few hours away from my home, while the Hannigan factory was located in far away western Kentucky; I quickly agreed to meet Dave and Ruth Ann Hannigan at their motel as the rally was wrapping up. The plan was to enjoy a leisurely trip in perfect weather, with me taking to the feel of piloting a sidecar as naturally as I’d done with motorcycles four decades before. The reality was a harrowing ride home in driving rain, herding a rig that seemed intent on ignoring my efforts to stay in my lane, leaving me wondering if I could turn around and get my money back! Puddles at the side of the road seemed to pull me toward the drainage ditch, roadway debris was difficult to avoid with an extra wheel to worry about, wind and crowning of the pavement seemed to require an awful lot of strength to compensate for, and steering was about as easy as doing figure eights in an antique truck with flat tires up front. But after a hundred miles or so the sun came out, the wind dropped off, and I began to sense a very different type of thrill. It wasn’t fast, it didn’t lean, handling was not effortless, but there was a certain coolness to navigating the roads of Vermont in a vehicle so different! Thus was born the crap-eating grin. There were no sidecar classes in New England, and the thought of driving my new rig one thousand miles to learn how to drive it properly didn’t sound like a very good plan. I figured by the time I arrived at the class I’d be pretty good. So I bought The Yellow Book, a sidecarist’s bible, studied the lessons and practiced endlessly in the parking lot of our local high school. When I felt fairly proficient I convinced my wife to don her helmet and ride with me, but it didn’t work out. I found her screams somewhat distracting. It was time to train the dogs to ride with me. I had four goldens at the time. My hope was that Tadcaster, who had just been diagnosed with an aggressive variant of lymphoma, would take to it like a fish to water and we’d have one adventure together before I lost him. But even though Tadcaster loved riding with me on our ATV, he was terrified of this rig. I tried Tulliver next. While he was comfortable on the dog bed, the moment the clamshell lid was closed he would try to claw his way out. Not good. Next came an abortive attempt to convince 18 month old Kazoo that this was a real treat, but at that age he had zero interest in anything he couldn’t eat or hump. That left Barley, the runt of the pack and my last hope. “Hey, Barley! Wanna go for a ride?” I asked, kneeling next to the rig holding the lid up. He jumped right in and sat facing forward behind the windshield like a natural. I clipped him in and closed the lid while he smiled happily. I started the engine – no change. I slipped into gear and pulled slowly forward to the edge of the driveway; he looked at me and wagged. I pulled out onto our dirt road intending to check our mailbox at the start of the pavement a quarter mile down the hill. Barley did just fine, peering ahead to look at the world with interest, noting every bird and rodent along the way, so I kept going. We passed the nearby Trapp Family Lodge where tourists pointed and took his picture, introducing him to celebrity. The cancer took Tadcaster in early Spring. He took with him a mountain of joy. Barley felt it too, as Tadders had been his constant playmate. We needed to recharge, he and I, so set off on our first multi-day trip, a trial run of sorts to iron out the bugs and find our shared rhythm of the road.